I am a sucker for the old serials from the thirties and forties, whether they are Bulldog Drummond, Mr Moto, Charlie Chan, Michael Shayne or The Saint, they just drag me in. Whereas some people just find them old and boring. Maybe I am wrong but I think a lot of these old programmers have more zip and spark than the comparable dross that is on television these days. This is especially true when you get an actor like George Sanders in the lead role. Sander’s exudes class, and that’s what makes a story such as this a joy to watch. 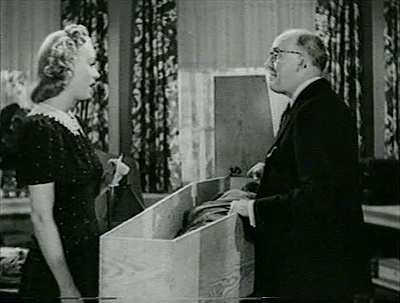 The film opens in Cairo, and a shady character, known only as ‘the partner’ delivers a coffin shaped crate to a shipping agent. Inside is the mummy of King Annanouk the third, and he is being sent by Simon Templar (George Sanders) to Professor Horatio T. Bitts (of the Keystone University) in Philadelphia, USA. It appears that the Saint had been promising to get the Professor a mummy for his research for years. Later, in Philadelphia, the professor is delighted to receive the mummy, and soon after Templar pays a call. Unfortunately the Professor can’t chat, because he has a faculty meeting. That leaves Templar in the company of the Professor’s daughter, Anne, who is not to enthusiastic to have Templar as a house guest. She has heard the rumours about him being a thief and a bounder and simply doesn’t trust him. Templar takes his leave by a window and disappears into the night. 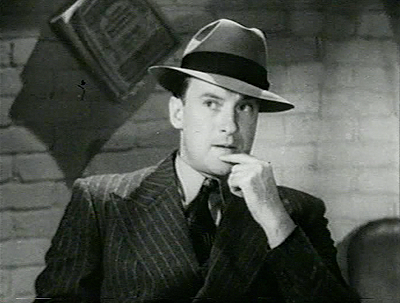 Meanwhile Philadelphia Chief of Detectives, John Bohlen (Donald MacBride) receives a visit from an old friend, Henry Fernack (Jonathan Hale), who just happens to be visiting the city on holidays. They are about to go out to dinner, when a call comes in about a dead body found in the Professor’s garden. 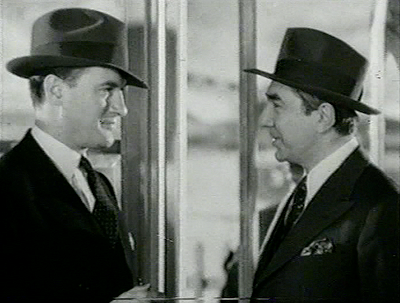 Both men head off to investigate. Next to the body, is the Saint’s calling card, and written on it is ‘Thus may all traitors die. S.T.’ As Fernack has knowledge of the Saint and his ways, he is asked to assist with the investigation and the apprehension of the Saint for murder. Of course, Templar is not a murderer. Somebody is setting him up. 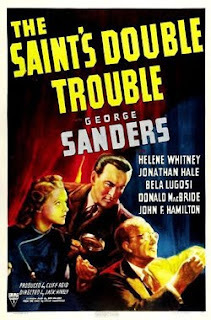 I guess it’s not really a spoiler, as the title of the film is The Saint’s Double Trouble, but there is a underworld villain, referred to only as ‘The Boss’ who is a dead ringer for Simon Templar, and he also happens to be a part of an extensive diamond smuggling racket. The Saint’s Double Trouble is the most complexly plotted of the Sander’s Saint series, and at the beginning as the story begins to play out, you’ll have to be patient, because all is not clear. Don’t worry; it will all make sense in the end. There’s some good plot twists here too. 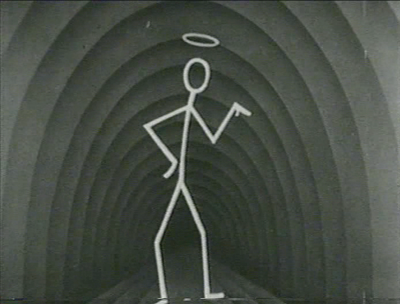 Another aspect of this film is that the famous Saint Theme (composed by Leslie Charteris) is put to good use too. All in all, The Saint’s Double Trouble is very enjoyable. • The Saint in London. • The Saint in Palm Springs.